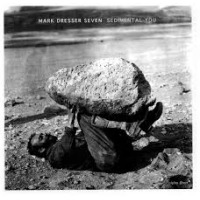 Bassist Mark Dresser has had a long, distinguished career in jazz and new music working with a long list of musicians that includes Anthony Braxton, Tim Berne, Anthony Davis and John Zorn but he hasn't recorded much lately as a leader. This project sees him leading and writing for a diverse group of familiar and relatively new players in an unusual front line combination of clarinet, flute, violin and trombone. The group has a unique sound, like some 1920's society dance band gone off the rails with the reeds and violin sliding drunkenly around in alternately hostile and somber moods. The title track is a fractured take on the old song "I'm Getting Sentimental Over You" with pianist Joshua White playing the melody while everyone else makes rude, chirping noises around him. Elsewhere the compositions break down into either political commentaries or tributes to musician friends. "Hobby Lobby Horse," dedicated to the craft store chain that tried to eviscerate Obamacare, is a sea of stabbing chords and derisive solos held together by Dresser's thick bass strumming. "Trumpinputinstoopin," named after two of today's most distinguished statesmen, is a blend of slippery, mock-sophisticated lounge melodies and sarcastic trombone and piano spots that eventually dissolves into chaos supported by Dresser's and Jim Black's pushy rhythms. "Newtown Char," dedicated to the victims of the Newtown and Charleston massacres, is introduced by Marty Ehrlich's anguished bass clarinet before settling into a sorrowful chamber elegy played by the entire group with violin and piano to the fore. The tributes are more lyrical and loving. "Will Well," for the trombone giant Roswell Rudd has a gentle cohesive sweep with eloquent soling by White and an arco Dresser. "I Can Smell You Listening," for the late singer Alexandra Montano, has a strong, slowly dancing melody led by violin and flute leading to Nicole Mitchell coolly blowing over moody jazz piano. "Two Handfuls Of Peace," for saxophonist Daniel Jackson , one of Dresser's mentors is a short but emotional ensemble piece with everyone sighing together slowly over the unfolding melody. The moodiness, sarcasm and emotion reflected in this group comes out as some sort of cross between the cynicism of Kurt Weill and the angry passion of Charles Mingus. Everyone in the group is excellent but the ultimate standout is one of the younger musicians, violinist David Morales Boroff. His sighing voice gives the unit a tender edge you don't get in most jazz ensembles and is a great contrast to Dresser's gruff, rumbling bass. This is music of dark, melancholy beauty that conveys both sorrow at the current state of the world and quiet hope for a better future. Track Listing: Hobby Lobby Horse; Sedimental You; Trumpinputinstoopin; Will Well (For Roswell Rudd); I Can Smell You Listening (For Alexandra Montano); Newtown Char; Two Handfuls Of Peace (For Daniel Jackson). 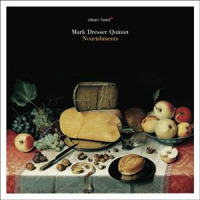 Personnel: Mark Dresser: contrabass; Nicole Mitchell: soprano and alto flutes; Marty Ehrlich: clarinet and bass clarinet; David Morales Boroff: violin; Michael Dessen: trombone; Joshua White: piano; Jim Black: drums and percussion.